In Africa, the potential for solar energy is immense. The continent is, in fact, is the brightest in the world. Its 30.37 million km² receive a solar irradiance equal to or greater than 2,000 kWh/ (m2 year). In the management of the energy resources, increasing the production of solar energy and other forms of renewable energy should be the top priority for policymakers, if they are keen to foster the African power transition towards a more prosperous and sustainable future. The African economies have been resilient. The growth of the real output has increased by 3.6% in 2017 and will reach 4.1% between 2018 and 2019 (African Economic Outlook 2018). Needless to say, when there is a certain growth in the economy of a country, inevitably there is also a rising demand for energy. And this is what is happening to Africa. During 2017, energy consumption increased by 2.9% and according to IRENA, the electricity demand should triple by 2030. These numbers speak clearly: the levels of industrialization and productivity are improving in Africa. The management of renewable resources is becoming increasingly important as it encourages economic development. So currently, this is a real challenge for the “Continent of the Sun“. Africa is endowed with significant renewable resources of all forms: biomass, geothermal, hydroelectric, solar or wind. This great energetic wealth could change the face of Africa forever. In fact, the diversification of energy sources increases the power generation capacity; the energetic shift would then resolve two of the Achilles’ heels in the energy landscape: satisfying the rising demand as well as replacing the poor-quality supply networks with reliable and safe energy supply. 600 million Africans still live in the dark and, for approximately 730 million people, the most common form of supply is that of biomass (IEA, 2014). But the change could be just around the corner. The renewable energy sector recorded an increase of 13% over the last year. Solar energy, instead, grows at 19%. McKinsey’s research shows that the capacity for energy production in Africa is 1.2 terawatts in total. Therefore, only solar energy, which Africa has in abundance, can supply around 10 terawatts of new energy. The African continent is increasingly turning towards the solar photovoltaic (PV) sector to guarantee a safe and sustainable energy source both on and off-grid. In addition, it is a very economical solution with a fairly competitive cost structure. According to Irena Report, solar PV module prices have fallen rapidly since the end of 2009, to between USD 0.52 and USD 0.72/watt in 2015. At the same time, the balance of system costs also has declined. As a result, the global weighted average cost of utility-scale solar PV fell by 62% between 2009 and 2015 and could decline by 57% from 2015 levels by 2025. Globally, new capacity additions of solar PV have increased six-fold from around 8 gigawatts in 2009 to around 47 GW in 2015. Also, the realization time of a photovoltaic project and its implementations are shorter than to others. Solar PV is a highly modular solution, both on-grid and off-grid. It can provide lighting and electricity to a single home off-grid, can be incorporated into mini-grids that can scale from several kilowatts (kW) to many MW, and at utility-scale can achieve higher economies of scale. The solar photovoltaic technology represents a realistic solution for the 40% of Africans living in rural areas, especially in sub-Saharan areas, and who do not have access to electricity. This specific segment of the population experiences various blackouts and failures of the deployment network and can live without electricity during whole days. The mini-network and off-grid projects do not require connection to a centralized or national transmission and distribution network and are therefore ideal for providing energy to those remote communities away from the existing transmission lines. Solar technologies and, in general, green technologies can promote a more inclusive economic development. Countries with low electrification rates have lower GDP per capita and are less developed. The basic rationale is that greater access to energy leads to improvements in health care, education, life expectancy, and economic opportunities. 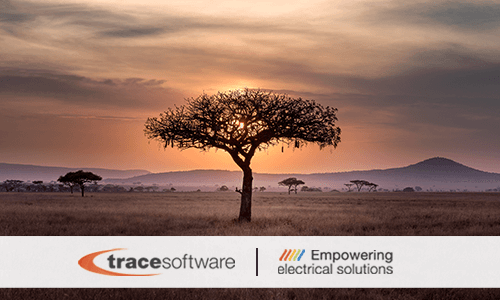 Trace Software International has headquarters in Morocco and operated throughout the African continent thanks to resellers and partners. The company is helping companies to implement a more strategic technologic approach in their processes in order to get the best benefits out of their asset. In the solar industry, archelios™ suite, the photovoltaic software solutions to manage the entirety of a complete solar project, has helped enterprises to make relevant steps towards a greener future for Africa. 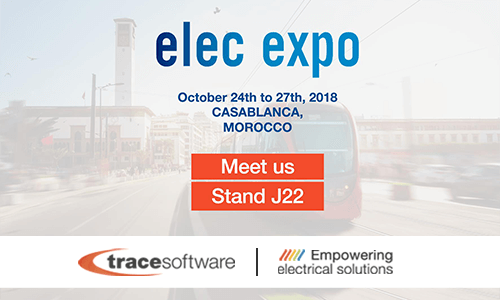 Once again Trace Software International is ready to fly to Morocco to take part in Elec Expo – the reference fair for the electricity, lighting, electrical engineering and industrial automation sectors of Africa. From 24 to 27 October, the event will be held at the Casablanca International Fairgrounds. Since 1987 Trace Software International has positioned itself as a global leader in the conception of avant-garde software solutions, with a unique specialization in the field of electricity, that is where the company’s core business resides. Elec Expo is an unmissable event, as it represents the ideal opportunity to highlight the urgency of the African power issue. In fact, 600 million Africans still live in the dark, with a greater concentration in rural areas. Furthermore, the country is characterized by a low access rate and a lack of reliable facilities. Electricity consumption and economic development are closely linked, therefore promoting access to electricity is key to the development of Africa. In addition, the fair is an excellent platform for promoting networking between African government, investors and local and international companies. The goal is to unite all the actors of the value chain in a unison effort in identifying the priorities of the country’s agenda and in the consequent proposition of efficient solutions. 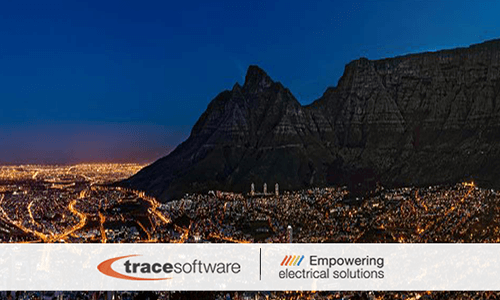 Trace Software International, which has a head office in Morocco and a network of distributors in the rest of the African continent, will showcase the latest-generation software solutions able to meet the needs of the various segments of the industry. These software tools have helped engineering professionals to set up a new technological approach within their organizations, capable of guaranteeing concrete competitive advantages in terms of time, quality and performance. elec calc™ is a software package that allows the calculation in real time of electrical systems. This is the only one solution in the world that integrates the management of low and high voltage, in compliance with various international standards. elec calc™ BIM is the first calculation software that seamlessly integrates elec calc ™ – the tool used for sizing electrical installations – in the Open BIM process. elecworks™ is the electrical CAD software specifically conceived for the design of automation projects and electrical installations. archelios™ suite is the solution allowing the entire management any photovoltaic project. From the feasibility study up to the complete generation of the calculation notes and the documentation necessary for the realization. The stakes are enormous. Indeed, the fulfillment of the economic and social promises of the region and of Africa, in general, depends on the ability of the government and companies to develop the continent’s enormous electric capacity. Therefore, decisive actions to promote access to electricity are urgently needed. Take advantage of Elec Expo, which has involved 7.632 visitors and 196 exhibitors in its latest edition, to analyze the African energy sector from a privileged perspective. Trace Software International awaits you at the booth J22.